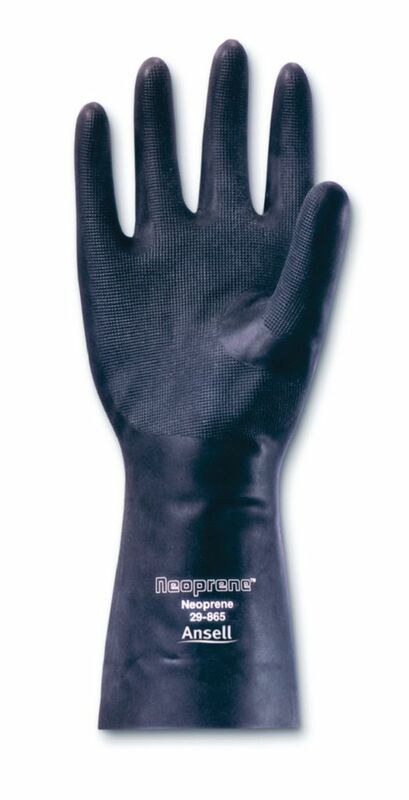 SType 29-865 neoprene gloves offer broad-spectrum protection with excellent resistance to a wide range of chemicals, including oils, acids, caustics, and solvents. Flock-lined gloves are case-hardened to increase chemical and abrasion resistance over ordinary neoprene gloves. Gloves are suitable for petrochemicals and refining operations, cleaning and degreasing, and electronics applications. Certifications: Complies with FDA food handling requirements 21 CFR (USA) and European Directives. Packaging: Gloves are packaged 12 pairs in a bag; 12 bags in a carton.